When planting an iris rhizome, the top of the rhizome (iris root) should be level with the surface of the soil in warm winter areas, and about an inch below the surface in cold (daytime freezing) winter areas. Spread out the roots facing downward on a mound of soil and pack soil firmly around the roots to eliminate air packets. Plant higher instead of deeper. Spacing between different varieties (names) should be about 2 to 3 feet apart. Same varieties should be about 1 foot apart. Iris plants need 7 or more hours of direct sunlight daily to produce good blooms. The winter and spring full sun areas in your yard would be ideal places to plant irises. Iris can tolerate some shade during the hot California summer days ( or similar climate). Iris plants can grow in any soil with good drainage. Water should never stand around the base of the plants as this causes rot. Heavy clay soils and sandy soils can be built up easily using potting soil. In areas with poor drainage, simply build up flower beds a few inches. Irises are heavy feeders and require fertilizing about two times a year, using a balanced fertilizer such as 6-10-10 or 15-15-15 combination. Never give irises a high nitrogren fertilizer (30-10-10). You can mix fertilizer into the soil at planting time. An easy wasy to remember when to fertilizer is Valentine's Day and Labor Day, which may need adjusting for your hardiness zone. Immediately after planting new irises roots, they should be kept moist, but never soggy or boggy. In the West, keep them damp until the winter rains begin, and then let the rain take over. After the rain stops, water the plants once week or so through the summer months. This is important for re-blooming iris, since they will not re-bloom without summer water. Automatic sprinkler systems will be okay as long as there is good drainage. OVERWATERING is a common error and can lead to disease or soft smelly rot. How to divide and replant? For best results, iris rhizomes can be divided and planted from mid summer to 6 weeks before frost. Dividing irises should occur every four-five years. Dig out the clump, remove soil, then twist or cut rhizome with knife at each joint. The joints are between each potato-like lump. Then trim back the leaves with scissors to 5-6 inches and roots to 3 inches. Sort irises and replant big healthy looking rhizomes. Extras can go to new areas or to friends and family. Plant iris that are the same variety (color) about 12 inches apart. Very little care is needed. Remove old leaves when they pull away without resistance. The bees can pollinate your iris flower, which can form a seed pod (egg shaped). It is important to remove old bloom stalks (with seed pods) to prevent your garden from being invaded by some new UNWANTED iris flower color. Weed around plants to provide good air circulation. 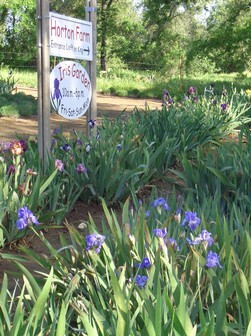 Bearded irises suffer from very few serious diseases in California. If you have a problem, give us a call or email, and we will assist you. 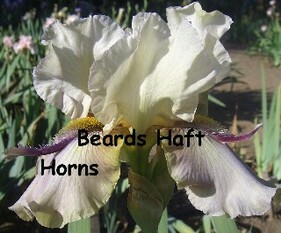 Horton Iris Garden specializes mainly in tall bearded irises. If you have any additional questions about iris flower culture please contact us. 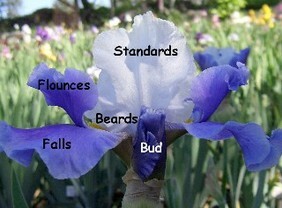 A person (hybridizer) cross pollinates two iris flowers and allows the seed pod to form. About 100 seeds from a pod are collected and planted (with exact records denoting pod parent and pollen parent,etc). After two or three years, the iris plants will bloom and the hybridizer decides if any are worth seeing next year. Unacceptable plants are destroyed. After two or three years evaluating the growing patterns and bloom colors, acceptable plants are named and registered with the American Iris Society. A name cannot be duplicated, and there are a couple pages of rules required on selecting a name. The whole process takes 5 to 7 years.